The simple method given below can be followed to make, energize and use the Choutisa Yantra to fulfill any just, reasonable and pure wish. 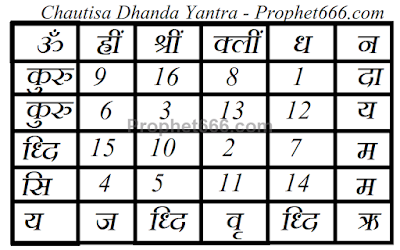 1] The Yantra can be prepared on any auspicious date, including on a festival like Diwali, Navratri or Dussehra. 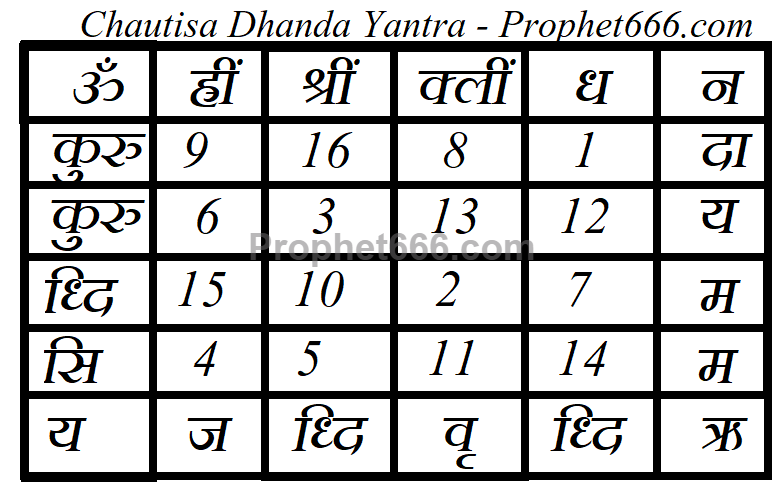 2] Two Similar Yantras, like the one shown in the image have to be prepared, one on Copper and the other on a Bhojpatra. 3] The Bhojpatra Yantra can be drawn using Ashtagandha Paste as the ink and a pointed wooden stick as the pen. 4] Then, both the Yantras should be kept on a Wooden Board and offered flowers, Dhoop and Diya of Pure Ghee. 5] Then, the practitioner should chant the Mantra given below 100, 000 times, this can be accomplished by taking a Sankalp to chant the Mantra for a fixed number of Mantra Chants per day, until the prescribed number is completed. The sooner the Yantra infusion procedure is completed the better. 6] Then, the Copper Yantra can be kept in the Shop, Office or Residence of the practitioner and the Bhojpatra version can be laminated and kept in the purse or pocket. 7] It is advisable that the practitioner chant the Mantra at-least 21 times daily thereafter.